The grouping tool of Wheelbase allows you to group together identical vehicles in Wheelbase into 1 listing (like how you'd add a bunch of similar files into one folder on your computer). Share 1 listing in all customer-facing platforms (website, Outdoorsy, etc) The listing will be the Parent vehicle's listing. Share a common description, photos, pricing and insurance settings. 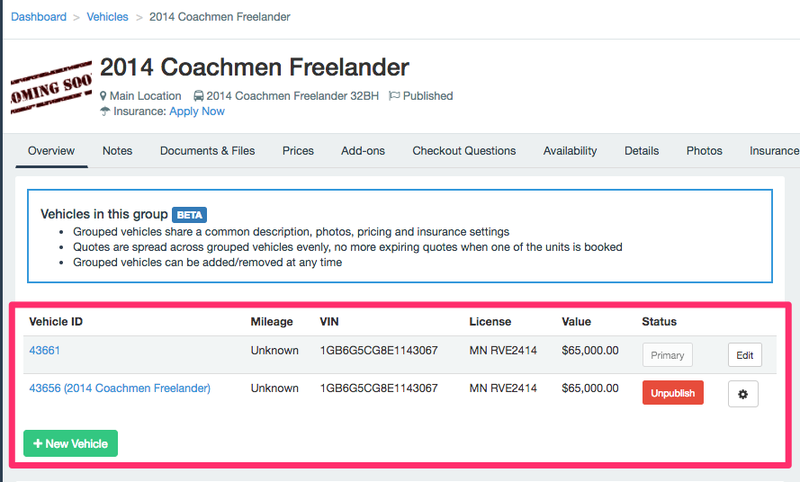 Quotes are spread across grouped vehicles evenly, no more expiring quotes when one of the units is booked (availability for that listing will show available until all the vehicles in that Group are unavailable on that date). All be managed under the Parent Vehicle in Wheelbase (the parent is the original, or master vehicle [think Lord of the Rings, one ring to bind them and rule them all]). Customer bookings that are created on your website, (through the group's 1 shared listing) will auto-assign to the vehicle in the group with the best availability. As the Wheelbase user, you can go to your Calendar, and click and drag across the dates of the vehicle of your choice to create a booking on any vehicle in a group. 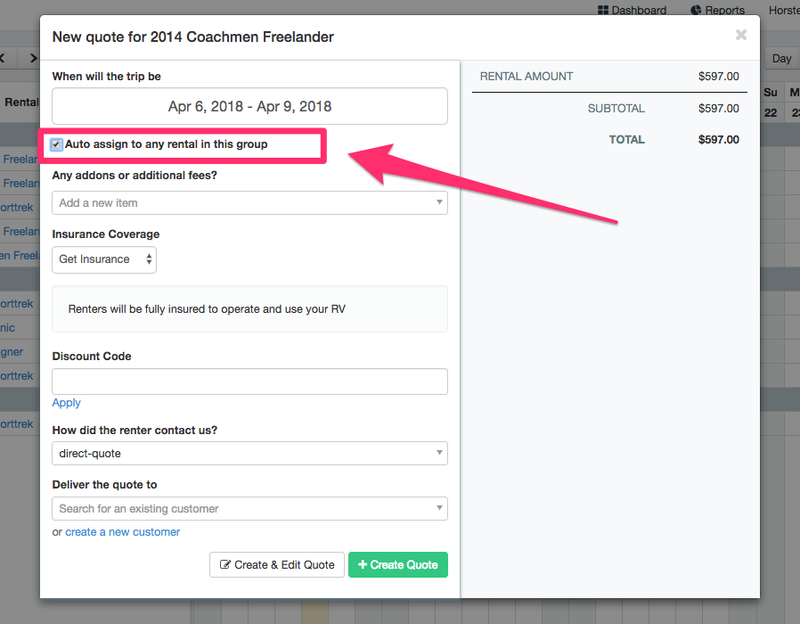 When the pop up (for you in Wheelbase) appears for the first stage of creating a quote, you have the option to select a to "auto assign to any rental in the group" or deselect it, to keep that quote on that specific vehicle. What is a Parent vehicle? The Parent vehicle is the master of the group, all the other vehicles will use the information and details of the Parent (price, description, photos, insurance) so make sure they are indeed all the same! What is a Child vehicle? The Children vehicles are the members of the group, who all copy the information of the Parent vehicle. The children vehicle will have their own availability, but bookings created online by your customers will auto-assign to the children vehicles until all the availabilities are filled up. How Can You Tell if Vehicles are in a Group?